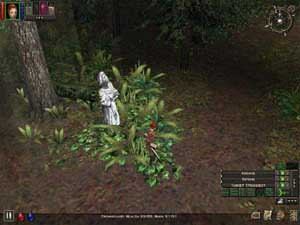 "Enter the wonderful world of Chris Taylor's Dungeon Siege. The Kingdom of Ehb needs a hero and that hero is you!" Dungeon Siege is the story of a humble farmer who has been given the arduous task of vanquishing an unstoppable evil. Your adventure takes place in the Kingdom of Ehb that for the last 300 years has been protected by a ring of fortifications that are under the control of the 10th Legion. Both men and dwarves live in harmony within the Kingdom of Ehb and follow one king. Even the strange creatures known as the Droog are allowed to roam the kingdom, provided they do not cause any mischief. With little trouble ever coming Ehb, one day the tables are turned and your life of farming is over. For a dark presence has spread itself across the kingdom and only one man or woman can stop it. 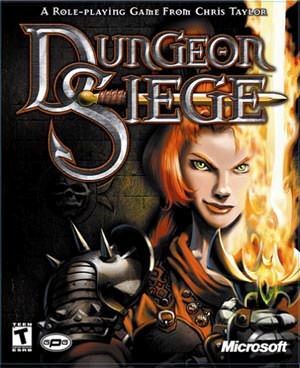 Impulsegamer's first reaction to the BETA build of Dungeon Siege was extraordinary, the final gold release of the game, if you can believe it has actually been improved ten folds. Wizardry, Ultima, Baldur's Gate were all games that blew the RPG world away with their stunning storylines and graphics and all were unique in their own way. 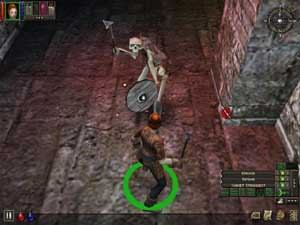 Dungeon Siege will definitely become the next-generation of role playing games. The entire world of Dungeon Siege is fully 3D generated which means that every creature, blade of grass, river or rock is a 3D polygon. This allows for perfect interaction with everything in the environment and allows the player to have full 360 degrees control of the camera which also allows zooming. The graphics of Dungeon are beautiful and from the first area of the game, you are immersed into a brand new universe that will become your personal playground. 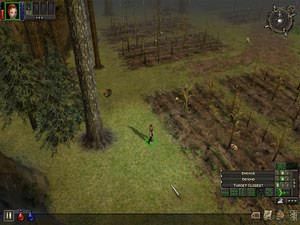 Unlike other isometric type RPG's, Dungeon siege uses great vertical landscapes that lets you peer down upon your enemies if you are on a hill or mountain. This amazing technology also lets you climb towers and see the entire landscape and the draw distance is amazing. There are dozens of weather effects from fog, rain, snow and storms that really help with the games atmosphere. 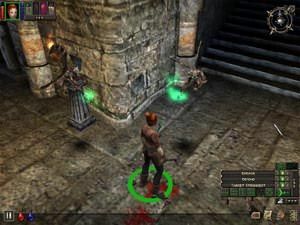 The beauty of Dungeon Siege is that game is not just another dungeon crawl, for every unique area you go into is completely different, whether its a dungeon, swamp, town or forest. There are dozens of playing environments within this game. The most amazing feature of Dungeon Siege is that there are no loading times. Somehow the programmers have used Windows multitasking system that loads certain areas in the background while you play, so everything is linked to create a perfect and flawless playing world. may or may not have an effect in gameplay. You can specialize in a variety of areas from magic, melee combat or archery. Just use whatever is required. Another impressive feature of the game is the party and inventory management tools that simplifies messy inventories and lets you keep focused on the mission at hand. control the combat choices such as attacking the strongest, weakest or nearest opponent. The developers have gone away from complex battle tactics which is good because it keeps the game going at a very steady pace without being slowed down by endless choices. Unlike some RPG's games, your character will automatically attack and not just stand there like a buffoon. to bring the forces of nature shaking down with powerful magic. Magic can be used both to harm and heal. Some of the spells you will come across during your travels are Healing Hands, Acid Cloud, Weaken, Summon Wraith, Lightning and Iron First. The developers have left nothing to chance when you use magic and some of the special effects are the best any game has seen. I would like to say more about magic but lets just say that you must play this game before I spoil anything more. As with all good adventure games, you will eventually meet people in your travels that will join your cause of good. These party members will help you throughout your journeys in Ehb. You may control a party of up to 8 different characters, which oddly enough doesn't become a problem because each character has their own unique scripts if danger does occur. Chris Taylor is a veteran of Role-playing games and has introduced one of the best elements into this genre. Pack mules! These allows your party members to concentrate on holding the most vital equipment on their journey while the pack mules carry the more mundane items. Do not worry yourself over the safety of a pack mule for when combat does take place, your pack mule can deliver a wicked blow from its hind legs if needed. The music of Dungeon Siege really helps give the game a true role-playing atmosphere and is not too distracting. The beauty of the music is that its not static and is truly dynamic and will change when you are faced with something different. The developers have even put lots of background sounds into the game, so you actually feel like you are travelling through a forest. Character voices are all top notch and don't sound tacky or forced on. Your travels in Ehb will bring you across a plethora of different characters that will help or hinder your task. From the good folk Norick and Gyorn to the evil Krug, the deadly Skeletons and the sly Darklings. 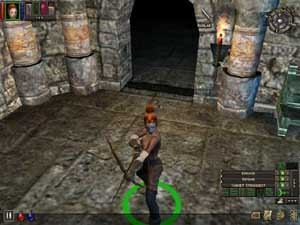 Dungeon Siege also features a brilliant multi-player option for either online or LAN action. Last but not least is the Siege Editor which lets you design and build your own worlds in Dungeon Siege, similar to the mods of Quake. I'm sure fans of this game are already creating their own areas for the world of Dungeon Siege. This game is probably one of the most well developed games I've ever come across and I highly recommend to this game to all of you. Whether you are a RPG fan or not, Dungeon Siege is truly a game worth having.